Brandon Moss, who was born on 16th September, 1983, is a Major League Baseball right fielder and is currently in the Philadelphia Phillies organization. Previously he played for teams like the Boston Red Sox in the years 2007-2008 and Pittsburgh Pirates in the years 2008-2010. The best way to define him would be by saying that he is a blooming new talent in the world of baseball. We hope to see much more of him in the years to come. Moss was drafted in the 8th round of the 2002 Major League Baseball Draft by the Boston Red Sox out of Loganville High School in Loganville, Georgia. He was then only 18 years old and was an infielder and pitcher when drafted, but later he transitioned into an outfield role. Moss climbed up ladder of minor league ball, starting with Gulf Coast Red Sox. He then played Lowell Spinners, Augusta GreenJackets and Sarasota Reds. He also played fort two years with the Double A Portland Sea Dogs in 2005 and 2006 and played for the Triple-A Pawtucket Red Sox. Brandon was brought up for a little while in 2007 to replace Eric Hinske when he was placed on bereavement leave. He was then again optioned back to AAA Pawtucket on the 10th of August 2007 when Eric returned. He was again brought up on September 1, 2007 when Major League rosters expanded to 40 players. On March 25, 2008, the Red Sox opened the season in Japan. Brandon was a last minute starter in right field. After he played the first two games of the season he was again sent down to Pawtucket. He was brought back batting 286 on the 29th of April but suddenly he was diagnosed with appendicitis and was brought to the hospital in an emergency. He still continues to be a Red Sox Roster as a relief player. 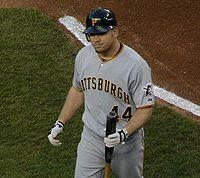 In 2009 he moved in with the Pirates and served as a right fielder in there. But with upcoming talents he was demoted from that role. He finishes 2009 with 20 doubles, 4 triples, 7 home runs, 41 runs batted in, 1 stolen base, to move on with a 236 average, .304 on base percentage, a .364 slugging percentage, in 385 at bats.